How can we use a Decision Tree Framework? 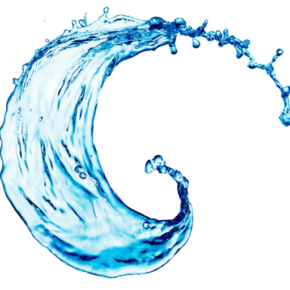 The goal of this framework is to outline a pragmatic process for risk assessment of water resources projects that can serve as a decision support tool to assist project planning under uncertainty. 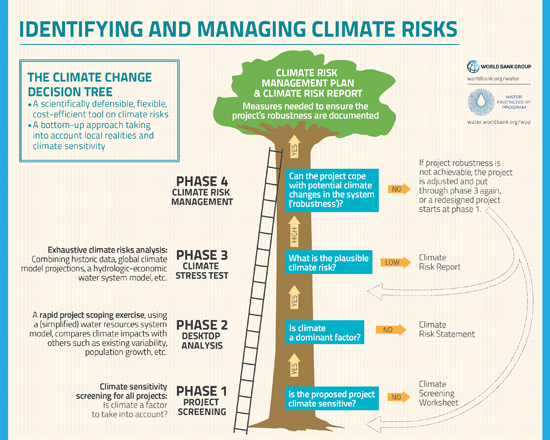 The Decision Tree Framework provides resource-limited project planners and program managers with a cost-effective and effort-efficient, scientifically defensible, repeatable, and clear method for demonstrating the robustness of a project to climate change. At the conclusion of the process, the project planner will be empowered to confidently communicate the method by which the vulnerabilities of the project have been assessed, and how the adjustments that were made (if any were necessary) improved the project’s feasibility and profitability. The framework adopts a “bottom-up” approach to risk assessment that aims at a thorough understanding of a project’s vulnerabilities to climate change in the context of other nonclimate uncertainties (for example, economic, environmental, demographic, or political). It helps to identify projects that perform well across a wide range of potential future climate conditions, as opposed to seeking solutions that are optimal in expected conditions but fragile to conditions deviating from the expected. The Mwache Dam is a flagship water resources development project in the Coastal Province of Kenya, intended to provide a total of approximately 220,000 cubic meters per day for domestic water use in the greater Mombasa area, and for irrigation use in the adjacent Kwale County. Water supply from the Mwache Dam is expected to reduce water deficits in the Coastal Province substantially. Deficits in the Coastal Province were nearly 60% of the 365,000 cubic meters per day demanded in 2015. The purpose of this study is to assess the risks to the current Mwache Dam design due to climatic and demographic change, and to evaluate adaptation and risk management options from a water supply perspective. The quantitative analysis applied in this work follows the decision tree framework developed by the World Bank’s Water Group. The Lower Fufu hydropower project is a proposed run of the river project in Malawi. The basic hydropower scheme diverts water from two rivers—the North Rumphi and the South Rukuru—via two small concrete intake dams and two tunnels to a single hydropower turbine complex. The combined discharge flow is released into Lake Malawi. The design problem consists of the choice of an economically viable hydropower plant size among the twelve design alternatives from 84 to 148 MW, in terms of levelized cost of energy. The twelve design alternatives are assessed through a bottom-up, robustness based approach considering climate variability and long-term climate changes. The Niger River is the second largest river in Africa, and is shared among nine riparian countries that are all under-developed and among the poorest. Despite of this endemic poverty, the Niger Basin has vast potentials for economic development, particularly for agriculture and hydroelectric generation. This project employs a bottom-up, robustness based framework for evaluating long-term climate risks from a number of large water supply investments including Fomi, Taoussa, Kandadji, and Kainji Dams and from planned expansions in the existing irrigated agriculture scheme across eleven irrigation zones.